The author provides an account of one of the greatest early aviation stories in a comprehensive and exciting manner. This should really be essential reading for everyone of school age. It is an inspiring story and it puts into perspective the huge strides that were made during the first 60 years of aviation. It goes almost without saying that an aviation enthusiast cannot afford to miss this fine account. SUBJECT: Aviation pioneers, famous pilots, RAF, record breaking flights, pioneering flights, Vickers Vimy, bombers, first trans Atlantic flight, long range flights, Newfoundland to Ireland by air. DESCRIPTION: The author provides an account of one of the greatest early aviation stories in a comprehensive and exciting manner. Today, trans Atlantic flight by jet airliner is a mundane experience because it is just another form of public transport where the flight can take less time than the time required to check in, clear security and then clear customs and security at the destination. Travel in the 1950s and 1960s was a little more exciting, if noisy and somewhat less comfortable, in piston engine propeller aircraft that used the technologies of WWII. However, the early years of flight were very exciting and daunting. The Wright brothers had made the first faltering flight in 1903. By 1908 Short Brothers in Northern Ireland had opened the first European aircraft factory, building under license Wright Brothers’ designs and developing special skills in designing and building float planes and amphibians. In 1914, a month before the outbreak of war, the Royal Naval Air Service had successfully dropped the first torpedo from an aircraft and were well advanced in building depth bombs, bomb aiming devices and bomb release mechanisms. As a result, the Royal Navy was to enter WWI with genuine weapons systems that could be used offensively even though other air services were initially flying frail machines where the only weapons were small arms provided by the aircrew, or depending on rigid airships to carry bombs to enemy cities. The RNAS were soon bombing German port and airship installations and bringing down Zeppelin rigid airships. From this point the Royal Navy was working hard to design aircraft carriers and long range land bombers. The RN already appreciated the potential for strategic and tactical bombing as a method to destroy enemy production and military infrastructure. When the RNAS and Royal Flying Corps were combined to form the Royal Air Force, the basis for long range bombing had already been laid on the RNAS experiences and vision. It was not that the RFC failed to see potential for bombing, but their primary task was to support the army on the ground, serving as reconnaissance and reconnaissance defence, with bombing envisaged as flying artillery in support of the Allied trenches. When the war came to an end in 1918, production of heavy long range bombers was just getting underway. The newly formed RAF saw its primary role as a long range bomber force, but it was limited by peace time budgets and military aircraft soon flooded the military disposals market. This was very good news for those looking to develop air freight and passenger transport because it provided an almost endless supply of bargain basement machines of all sizes, including the Vickers Vimy long range bomber. For its time, the Vimy was a very powerful machine that had been built to attack targets deep inside Germany. This meant that it had the capacity to carry fuel for long range missions, a viable bomb load, and defensive armament. By stripping military equipment and adding new fuel tanks at a similar weight to the deleted military equipment and bombs, the Vimy promised to travel further than the distance from Newfoundland to the British Isles, and still have reserve fuel to cater for unexpected circumstances, while carrying a crew of two who could fly and navigate a route of some 2,000 miles. There was to be some difference between theory and practice. The first trans Atlantic crossing was completed by NC-4 flying boat, taking a 1381 mile leg from Newfoundland to the Azores, a 1096 mile leg to Lisbon, Portugal, and then a third leg of 840 miles to reach Plymouth, Great Britain. This flight started on 16 May 1919 and completed on 31 May 1919. Other competitors planned on a direct non-stop flight and rivals Hawker and Mackenzie Grieve crashed into the sea on 19 May 1919, 850 miles short of Ireland. When Alcock and Brown were asked how they would navigate and know where they landed, the flippant reply was that if they saw two men in a bog beating each other with lumps of wood, they would know they had reached Ireland. If they found people playing cricket it would be England and if they saw a couple romantically engaged atop a haystack, they would know they had landed in France. Although the reply may have been flippant, it accurately demonstrated the navigational challenges in an open cockpit at anywhere from sea level to 10,000 feet, passing through variable strong wind and having to navigate by dead reckoning if cloud blotted out Sun or Moon and stars. A few degrees error could encompass a destination in an arc from Scotland, Ireland, England to France. Calculations suggested a probability that the fuel could last long enough to allow they to reach mainland Europe. In the event it was to be two airmen in a plane in an Irish bog. The scale of the undertaking is very difficult to fully appreciate today. At the time, the stall was an observed phenomena that was still to be correctly understood. 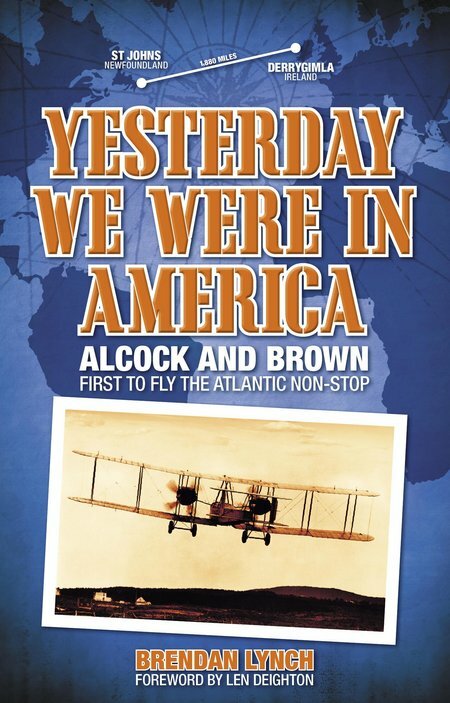 Alcock and Brown had to cope with the phenomena during their trans Atlantic flight. Very few pilots had successfully made a flight of anything like this endurance. The knowledge of wind speeds and patterns at altitude was almost a complete unknown for a flight of this nature. There was also little understanding of temperatures at altitude. RNAS and RFC fighter pilots had managed to reach altitudes of over 20,000 feet without oxygen for short periods as they attempted to acquire the advantage of height before engaging German fighters. The pilots suffered the effects of inadequate oxygen and hoped that if the breeches of their machine guns had frozen, they would thaw out before they reached the German aircraft below them. By this time, aircraft engines were sufficiently reliable to provide a working life of more than 40 hours, but in a series of bursts of use with maintenance periods between them. The 400 hp 12 cylinder Liberty engine was much favoured for long range aircraft and was war proven but a trans Atlantic non stop flight would stretch it to the extent of its capabilities. Just to add a twist, the Spanish flue epidemic had swept around the world and included several key figures at Vickers amongst its victims. Those were all long odds, but Alcock and Brown had to first rely on their support team to strip down their Vimy for transport from the Vickers factory to Newfoundland, where it would be assembled again and flight tested before awaiting favourable conditions for the attempt to fly the Atlantic. All of this was daunting for the most experienced airmen, but to all of this was added the pressures of competition to be the first of the four competing teams to succeed. The author has faithfully recounted the events and pressures, the highs and lows that manages to introduce suspense even if the final outcome is known before reading begins. The text is very easy to follow and engaging. The two b&w photo plate sections provide very able illustration. This should really be essential reading for everyone of school age. It is an inspiring story and it puts into perspective the huge strides that were made during the first 60 years of aviation. It goes almost without saying that an aviation enthusiast cannot afford to miss this fine account.